The 2014 Juke has changed little from the 2012 and 2013 models, but this year will offer two additional colors: Red Alert and Bordeaux Black. Both the Midnight Edition and the Sport Package are also available this year. The Midnight Edition adds 17-inch Black Wheels, a Sapphire Black rear roof spoiler, Sapphire Black mirror caps and privacy glass. The Sport Package includes a body-color rear spoiler, 17-inch aluminum alloy wheels, and stainless a steel exhaust tip. Also available this year is the Juke NISMO sport-tuned package in both front-wheel (FWD) and all-wheel drive (AWD) options. These can be had in either a six-speed manual or NISMO-tuned continuously variable transmission (CVT, manual trans not available in FWD). Pricing (MSRP) begins with the base model Juke S CVT FWD at $18,990 plus destination. The Juke SV MT (manual trans) FWD is $20,990, plus destination, and the Juke SV CVT FWD is $22,040. 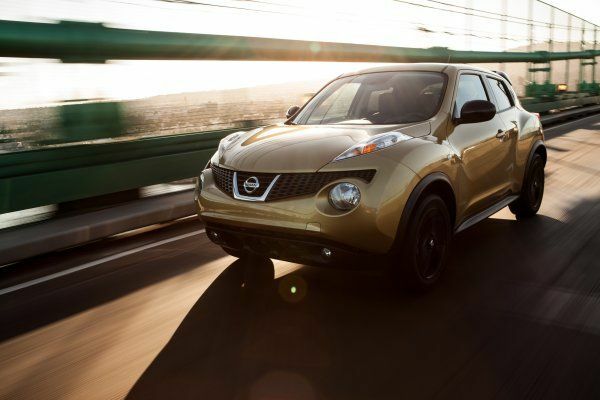 The Juke SL CVT FWD premium package is $24,290 plus destination. Jumping to the all-wheel options, the Juke S CVT AWD base is $20,990, plus destination, the Juke SV CVT AWD is $23,740, and the premium Juke SL CVT AWD is $25,990 plus destination. The NISMO packages include the Juke NISMO MT FWD at $22,990 base (plus destination) and the Juke NISMO CVT AWD at $25,290 plus destination. Available is the Integrated Control (I-CON) system that combines control of the automatic A/C and three-mode drive selector - you can take a tour of how that works in the video below. Other available options include leather interior, Intelligent Key with Push Button Ignition, RearView Monitor, Rockford Fosgate ecoPUNCH audio, and Nissan Navigation.